A perfect device for providing great performance and plenty of storage space, this Hitachi 100 GB hard drive is high-performing and well-constructed. 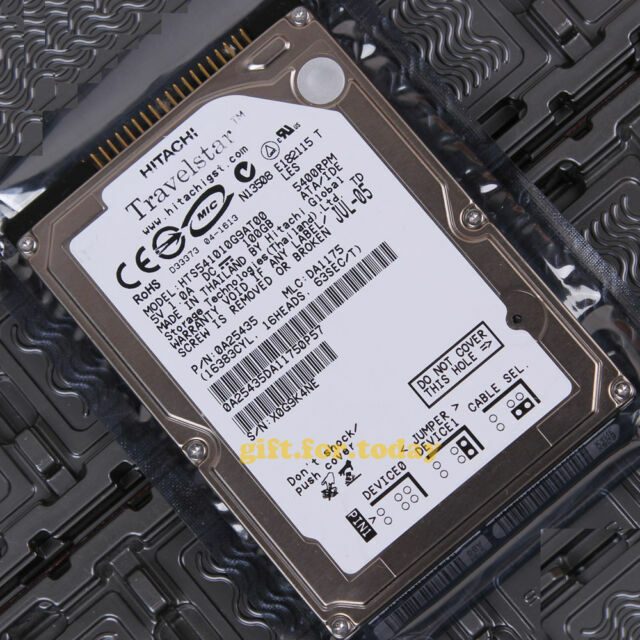 This Hitachi 100 GB hard drive is a great pick for handling heavy data loads. Hardware enthusiasts and IT professionals alike can take pride in the operation and performance of the Hitachi 5K120 HTS541010G9AT00. This internal 2.5-inch hard drive is easy to install, so you can simply use it in devices supporting ATA-100 and IDE interfaces. With solid construction, the Hitachi 5K120 HTS541010G9AT00 is very stable, so you can enjoy the benefits of sustained flawless performance without problems from disk crashes or data errors. Preserve all of your cherished uploaded digital photos, downloaded music, and high-definition videos with more than enough space leftover thanks to the significant storage capacity included with this Hitachi 100 GB hard drive. Copy massive photos, documents, and applications in mere moments with the ultra-fast 5400 RPM rotation speed found on the Hitachi 5K120 HTS541010G9AT00. Also, you can squeeze out super-fast access times while analyzing information, copying files, or loading software as this internal 2.5-inch hard drive includes an 8 MB data buffer. Fits and works in my external drive shell. Great for back-ups.